Last August when we started on our journey of home schooling I asked Thorin what he wanted to learn. Without hesitation he said: “Ballet”. I remembered a brief obsession with the dance documentary “First Position” but other than that I couldn’t account for his answer. Through a friend I found a dance school. I stared at him wondering what else didn’t I know about my own son. I didn’t press for answers. I had made enough mistakes trying to understand his process with his photography. * He knew what he wanted. The WHY of it wasn’t any of my business. I told him he would be the only boy in the class. “Okay”. Every Monday night Ward took Thorin to dance class. Thorin left excitedly with his jazz/ballet and tap shoes in his backpack. He wore black leggings and a matching shirt. They were reluctantly covered by sweat pants and various Avenger t-shirts. When he came home he insisted on wearing his dance clothes the rest of night even sleeping in them– he looked as much like a cat burglar as he did a dancer. Every day he danced—tapping across the kitchen floor, hip shaking jazz routines and pliés followed by a little jump. I was an enthusiastic audience who maintained a respectful distance. On ‘American Idol’ nights Thorin did elaborate dance moves during the performances using the music and singing as his score. He was entertaining and was a welcome distraction to the unexplainable power and rise of Rayvon Owen over Quentin Alexander, Joey Cook and Tyanna Jones. 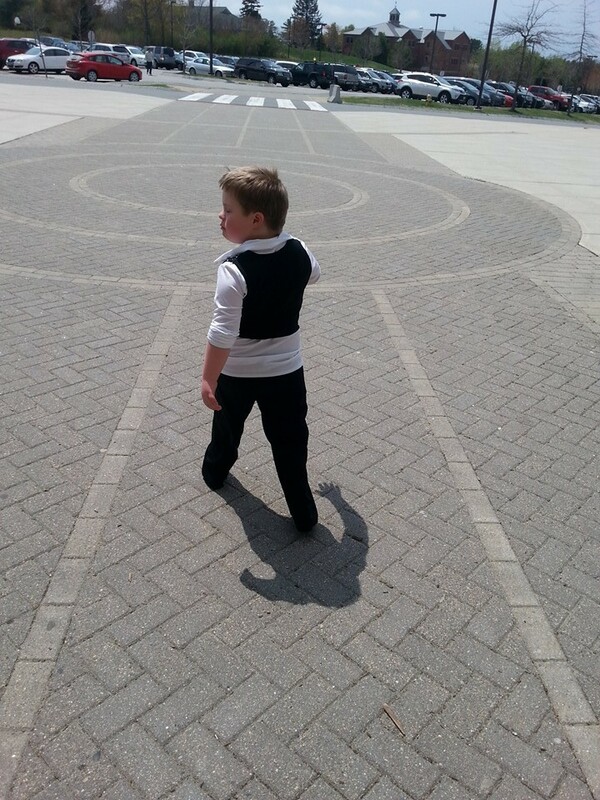 In March he came back from class with his dance costume for the May recital. He asked to wear it for Idol. In my mind’s eye I saw him painting in it, playing baseball in it—destroying it. So I hid it. I distinctly remember saying to myself as I placed it in it’s hiding place: “Why am I putting it here? I never put things here.” Then I answered myself: “This way you will remember!” But in reality I promptly forgot. More on that later. Ward and I were not convinced Thorin would go through with the dance recital. He took theater during the same period. The classes were in 3 week cycles each with a new mini-play. He loved the class but each time, five minutes leading up to the performance for parents he bailed preferring to sit in the audience. It didn’t bother us because it didn’t bother him. The theater teacher was philosophical about it: “For him it’s the journey”. The two weeks leading up to the recital I took Thorin to dance class. I had never even seen the place. Thorin had to tell me what street to turn on, where to park and what door to go in. I learned a little something about myself in those two nights: I was not as serious as the other mothers about dance and I was the only one in the history of the school who lost their kid’s costume. I was ashamed I had considered he might not follow through and I was anxious at the thought of having to find a pink bow tie. I did find the costume after tearing the house apart twice. Thorin advising me along the way: “Slow down. It’s fine”. And he would happily wear his : “Hulk costume”. Thorin’s did go through with the dance recital, securing Miss Alivia’s 100 % rate. As we watched from the audience I saw how composed Thorin was. He gave us a quick wave but his focus was on the audience as a whole. I saw he was not doing this for us– it was for himself. For nine months he had prepared to perform something he loved doing. I was crying because at eight-years-old Thorin had figured out something I didn’t learned until my 30’s: Do what you love for no one else but yourself. My guess is the greater part of parenting is not getting in the way of your child becoming who they are. * For other posts on Thorin’s photography: POV, Shutter Bug,Warholian Selfies, T’s Photos of Sally’s Garden Picture This, Portrait of an Artist as a Young Boy and Typical Images from 45 & 68 Inches. 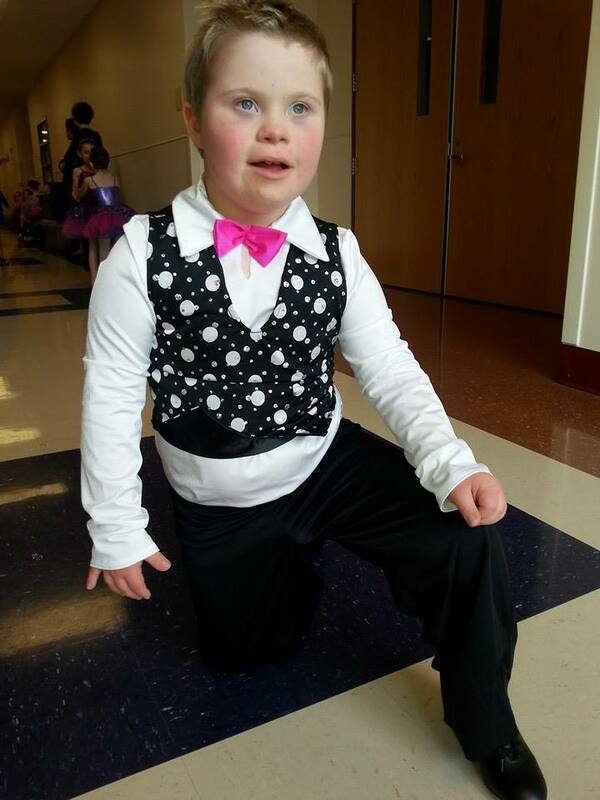 This entry was posted in By Notatypicalmom, Down syndrome, education, homeschooling, Inclusion, life lessons, Parenting, unschooling and tagged advocacy, ballet, dance class, Down syndrome, Down syndrome adoption, First Position film, homeschooling, jazz, tap, unschooling by Kari Wagner-Peck. Bookmark the permalink. Happy to hear! Congratulations To Thorin and Happy Mother’s Day to you. A big Nod to Ward as well. You are, both, Extraordinary Parents. You are the extraordinary one– finding us Thorin. Happy Mother’s Day, Karin! Not extraordinary — lucky! You go Thorin! Your story reminds me of one I read about Bill Clinton that actually touched me. He was incredibly moved by Chelsea’s commitment to ballet because she wasn’t very good at it. He was in awe of her ability to commit to something so fully and with such passion despite the fact that she wasn’t going to be the prima ballerina. Apparently, and surprisingly considering the source, Clinton was humbled by his daughter’s dedication because he knew that he didn’t have the courage to do the same. I’ve had similar moments of deep respect for teammates who ran for the team and practiced consistently but who were never going to be any good. None of this is to say that Thorin wasn’t slaying that stage, but I greatly admire the kid for “doing him.” To me, that’s the definition of cool. I admire him for the same reason:) I could not have done it at eight. I would not have known IT existed at eight. IT that feeling of passion where you lose time. That bliss — before the word was over-used. I don’t know if I could do it now! That ability to be in the world on your terms is an admirable thing. E.M. – Happy Mother’s Day! “Do what you love for no one else but yourself.” Love this so much. Also, that picture of him walking away? He looks SO cool. He’s got that, “Yeah, I’m the bomb and I know it,” swagger. What a great experience to have at 8 years old! To have participated in a performance in front of an audience with total confidence. He looks great by the way. Very snazzy! Great post. Juliet’s recital is this weekend–contrary to Thorin, she mostly does it to ham it up for the audience, so not so much for her love of dance as attention. And, see my post on Mother’s Day–maybe the video will explain why Rayvon outlasted the others you mention. Love this story. Our children are our greatest teachers.